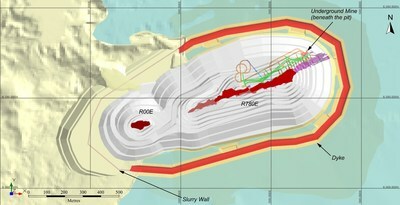 The R1515W, R840W and R00E zones make up the western region of the Triple R deposit and are located on land, where overburden thickness is generally between 55 m to 100 m. R1515W is the western-most of the zones and is drill defined to ~90 m in strike-length, ~68 m across strike and ~220 m vertical and where mineralization remains open in several directions. 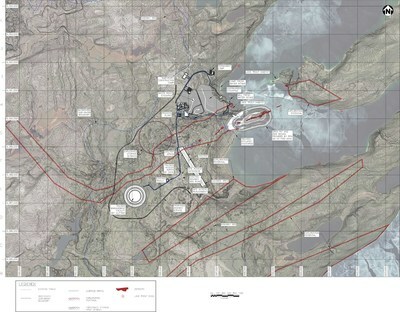 R840W is located ~515 m to the east along strike of R1515W and has a drill defined strike length of ~430 m. R00E is located ~485 m to the east along strike of R840W and is drill defined to ~115 m in strike length. The R780E zone and R1620E zones make up the eastern region of the Triple R deposit. Both zones are located beneath Patterson Lakewhere water depth is generally less than six metres and overburden thickness is generally about 50 m. R780E is located ~225 m to the east of R00E and has a drill defined strike length of ~945 m. R1620E is located ~210 m along strike to the east of R780E, and is drill defined to ~185 m in strike length.